A kennel or crate can help your dog feel safe and comfortable in his new home, because you’re providing the security of a den. Whether it’s a plastic crate, a wire kennel, or a portable wire enclosure — sometimes called an exercise pen — your dog needs somewhere to feel protected and private. Dogs feel safest when they can rest without feeling they need to watch their backs. Your dog probably wants to be near you, so situate the crate in a room where your dog can at least hear, if not see you, when he’s resting. One good choice for a doggie den is a plastic crate with solid sides and a door that you can leave open or closed. Make sure the den is comfortable and soft, and, especially if the kennel is all wire, cover the floor, and perhaps the top with a blanket. To introduce your new pooch to his room, get his attention with a treat or by leading him to the den by him leash. Toss a few treats into the den and step back. Don’t force your dog to go inside the den, and don’t shut the door after him if he goes in on his own. If he goes in to get the treat, praise him, but stay back. Let your dog know his den is a safe spot, not jail, and even you won’t grab at him while he’s in there. Talk softly and pleasantly to your dog as he explores his new den. Hide treats inside the den periodically, so that he gets the message that he may find something delicious inside his safe, comfy spot. Young puppies can quickly learn to accept the den, but can stand to be in it only a few minutes at a time at first. Even if your pup is whining and crying, don’t make a big deal about it, or risk increasing your pup’s anxiety. Put him in the den, shut the door, stay nearby, talk casually but reassuringly to him, and then let him out again. Increase the amount of time your dog spends in the den just a few minutes at a time over a period of a few days. Pretty soon, your puppy gets used to the routine and recognizes the den as something safe and predictable. 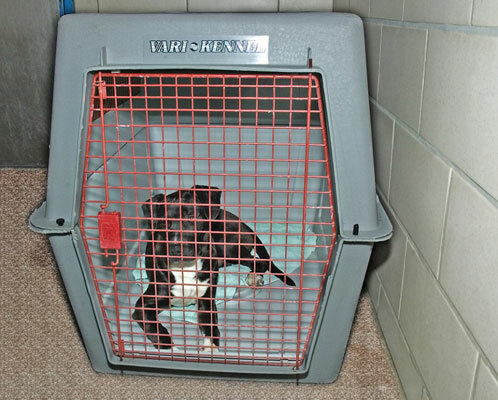 In the case of an older dog that has neither been in a crate before nor had any bad experiences with the crate, not forcing the issue is an important attitude for you to take. Just leave the den door open and let your dog adjust at his own rate. If your dog’s first experiences with his den are filled with positive associations like pleasant calm interaction and plenty of yummy treats, you can set the stage for a happy home.